We pride ourselves on delivering the best virtual staging service at the lowest price point in the industry. If you find a lower price per photo from another company we will happily match it. It's that simple! 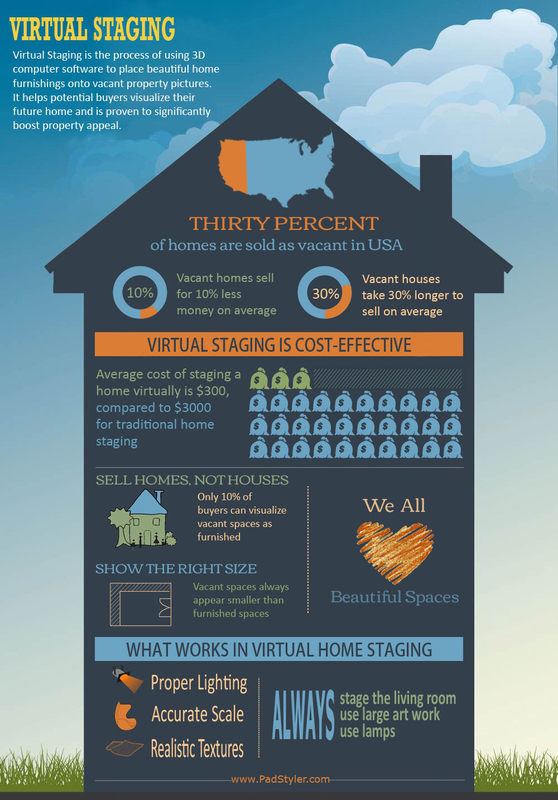 Is Virtual Staging right for you? Drew Scott, the beloved TV host from HGTV hit show Property Brothers, chooses PadStyler for 3D Renderings and Virtual Staging. Drew’s social media followers submitted photos of their outdated homes. 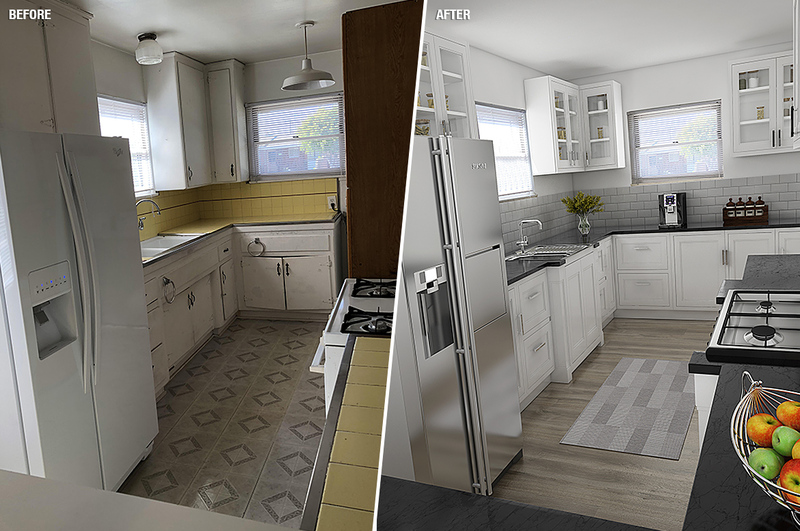 Drew used PadStyler to showcase how these rooms could be renovated and refurnished into attractive living spaces. No storage. Create a space that shows maximum function with ample storage. Keeping original Character or adding Character that ties into era of home. Be careful not to over-renovate. You will most likely be competing with new builds in your neighborhood. Create flow and more open concept feel. Utilize the space. Update with new cabinets new countertops new lighting and new flooring. Don’t oversell the house with pictures. If the listing says it’s renovated, buyers expect to see a beautiful renovation. Showcase the features of the house that will help to sell it. Renovate to create or make use of the space. New cabinets and utilize space with an island. Just because your house is small doesn’t mean it can’t have a big wow factor. Create flow and function. Minor updates and decluttering the space will give it a fresh feel. Re-organizing to give the space a new clean look. Structural issues need to be addressed to create a livable space. Don’t spend on fluff if you have no function. Spend money to make the space more functional and take advantage of the space and natural light. New Home Construction has been booming across the country. According to a survey by Trulia, twice as many people prefer a newly built home over an older home. The biggest reasons cited are modern amenities and the ability to customize the home to their preferences during the construction process. This also means that buyers expect more from their pre-sales and builder consulting experience than ever before. In a cut throat environment of increased competition from big players, combined with lofty buyer expectations, real estate developers have been turning to innovative digital marketing tactics to stand out from the pack. Here are some New Construction Marketing ideas that are sure to delight your customers and help you build a Tech-Savvy Construction Company. Virtual staging is the new wave in home staging where you stage the pictures of homes using 3D furniture and décor, instead of bringing in actual physical furniture into the house. According to NAR (National Association of Realtors), 90% of buyers cannot visualize a vacant property effectively. Virtual home staging is a cost effective way to show the potential of the property to future buyers without renting expensive furniture or hiring movers. Virtual Staging can also allow you to stage the same space in multiple different ways tailored to each demographic. In the age of Pinterest and Instagram, the power of Virtual Interior Design as a New Home Marketing Tool cannot be underestimated. Most Home Builders are not marketing their properties early enough. The smartest property developers understand the power of 3D Architectural Renderings as a pre-construction marketing tool. 3D renderings give you the ability to start marketing homes as soon as the architectural plans are submitted, well before you break ground. 3D Walkthrough is a video tour of the property where the customer can virtually walk through the house before it’s built. This type of rendering goes a step further from still 3D renderings in helping convey a sense of space to potential buyers. 3D Walkthrough also takes the guesswork out of the construction process by showing the clients exactly what to expect from the final finished space. Modern home buyers expect more control and involvement with the home building process. The sales center experience has evolved where just having a physical office with paper brochures no longer cuts it. Innovative construction companies provide interactive lot selection and home design apps via mobile, tablets and in-office sales kiosks. Buyers can view fully furnished 3D floor plans and virtually configure their options in real-time. This level of interaction gives potential buyers a psychological ownership of the home they are configuring, helping boost sales and customer satisfaction. All of the above tactics help bring interested buyers through the door. What happens when they leave? That’s when automated drip email marketing comes into play. Drip marketing refers to pre-configured email marketing messages that go out interested buyers at certain pre-set intervals from the time when they visited your website or sales center. You can use each email message in the chain to highlight certain aspects of the neighborhood, construction quality, available plans, options and more. This type of marketing only needs to be designed and scheduled once. Once you set it and forget it, it pays dividends for as long as it runs. Most email marketing systems support some form of automated drip marketing. Our platform of choice is Mailchimp. Large multifamily developers in major metropolitan markets have already been using these types of marketing strategies successfully. These are increasingly becoming accessible to smaller real estate developers as well. In a hyper competitive business of New Home Sales, building beautiful homes and capturing buyers emotions using digital marketing techniques is a sure-fire recipe for success. Proves that sunny skies and greener grass help sell homes faster and for more money. PadStyler (https://www.padstyler.com) today announced that it is launching an industry first virtual curb appeal enhancement service to help real estate agents sell homes faster. This new service offering is a natural extension for PadStyler, which already provides virtual home staging and real estate marketing consulting services to agents across the world. As part of this service, PadStyler can take the exterior picture of any real estate listing and enhance it by adding sunnier sky, greener grass and brighter paint. These enhancements instantly boost property appeal of online listings and result in more showing inquiries. According to National Association of Realtors, 90% of home buyers now search for homes online. On average potential buyers only look at a listing for three seconds while browsing, before deciding to click on it for details. This makes the cover picture of the listing the most important asset that the agent has to make those three seconds count and draw the buyers in. In addition to the standard exterior enhancements, PadStyler virtual curb appeal enhancement service has also been extended to do things like virtual snow removal, fixing exterior imperfections, improved landscaping and more with great results. PadStyler.com, based in Boise, Idaho, provides affordable virtual home staging and real estate marketing solutions to real estate agencies around the world to help them sell homes faster, and for more money. PadStyler backs all its services with a 100% money back guarantee.